El creador de puzles (también conocido como Puzzle Maker o Editor) es parte de la Perpetual Testing Initiative/es en Portal 2, una actualización del 8 de mayo de 2012 que permitió la creación de cámaras personalizadas para uno y varios jugadores. Para crear una cámara cooperativo, se debe marcar como "Puzle cooperativo" en el menú del archivo en el editor. 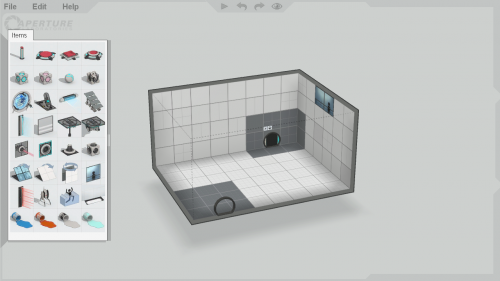 The editor was first mentioned within The Final Hours of Portal 2, "[An in-game level browser won't be of much use unless] Valve figures out how to make designing Portal 2 maps an easier process. It has a plan there too, it comes in the form of a simplified level editor [...] a Photoshop for test chambers". The "Puzzle Creator" does not appear to have a single official name; Valve published a blog post on the October 27, 2011 referring to the editor as the "Puzzle Creator", later referred to it on the blog post of April 27, 2012 as "Puzzle Maker" and simply calling it "Editor" in-game. 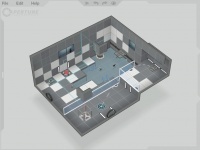 The Puzzle Creator features a stylised representation of the test chamber being worked on; featuring a simplified, bright, and flat color palette, and models and textures lack the level of detail that they would have in-game. The initial view of the Puzzle Creator. Hovering the mouse over the left screen edge displays the item list. The top edge of the screen features four buttons: "Build and play puzzle", "Undo", "Redo", and "Switch to game view". Selecting and dragging the upper-right corner pans the camera view. Selecting and dragging the right edge controls the camera zoom. Selecting and dragging the lower-right corner controls the camera rotation. - Select a block or item. - On background: Pans camera view; On chamber: Context menu. - Click: Controls camera rotation; Scroll: Controls camera zoom (follows cursor). P - Toggle surface portalability. ++- - Push/pull (extrude) surface. Delete/← Backspace - Delete selection. ⇧ Shift+ - Allows for batch selection of surfaces. ctrl+ - Duplicates an item (does not duplicate any connections). alt+ - Places an item on the surface opposite to the one facing the camera. space+ - Pushes/pulls surface if selected. Tab ⇆ - Cambiar a vista del juego. The following items are exclusively featured in the Portal 2 - Education Version. Click a chamber surface tile to select it. Click and drag across several surfaces to block-select. Right click selections to change surface portalability. Drag the boundary edge of a selection to move the highlighted surfaces. Press and drag the background to rotate your camera view. Move the mouse to the far left edge of the screen to open the puzzle item palette. Right click an item to change its properties or connect items together. The entry door, exit door, and large observation room are mandatory items. They can be moved, but they cannot be deleted or duplicated. Use the + and - keys to quickly modify selected chamber surfaces. Press P to change portalability of selected surfaces. Use the controls along the far right edge of the editor window to pan, zoom, and rotate your camera view. Rotate the camera view up to work on the ceiling. Rapidly duplicate puzzle items by holding down Ctrl while moving them. Use the mouse scroll wheel to zoom in and out. Some items need to occupy space behind the surface they are mounted to. Look for a dashed outline of the required volume while you move them. Some item placements are incompatible and will show an error indication until they are fixed. Ejemplo de una cámara simple. This page was last modified on 15 August 2013, at 20:27.